Hareidi enlistment, land concession referendum bill and increased voter threshold all on the table - to opposition's fury. 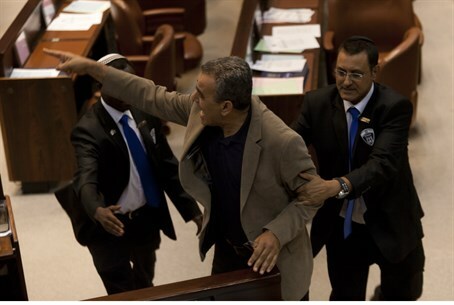 The Knesset is expected to have a stormy week this week as the Coalition seeks to pass three highly controversial bills. A marathon session of debating and voting will begin Monday at 11 a.m. and will end only at 2 a.m. Thursday. The first bill up for vote will be the Governance Bill, which would significantly raise the voting threshold, risking several small parties’ ability to enter Knesset. The second will be the enlistment bill, which will see hareidi yeshiva students become eligible for the draft for the first time in Israel’s history. Finally, the Knesset will debate the National Referendum bill, which would require the government to hold a national referendum before conceding Israeli territory to a foreign entity. The bill could have an impact on Israel’s negotiations with the Palestinian Authority. Voting on the bills was deliberately scheduled in a back-to-back marathon in order to keep the pressure on Coalition MKs to vote according to Coalition commitments. Most of the bills are supported by some Coalition members but not necessarily by others; for instance, Yesh Atid strongly supports the enlistment bill, while the Jewish Home party backs the National Referendum bill. The planned voting marathon has Opposition members angry. MKs from the opposition have accused the government of “muzzling” Coalition MKs who might have voted against at least one of the three bills, if not for the fear that doing so would mean the bills they want to pass would lose support as well. The Opposition – made up of the hareidi factions, Arab parties and the left-wing Labor and Meretz parties - is largely against all three bills. Debates over the Governance Bill in particular led to rare agreement between the Opposition factions.